I’m dreaming of outfits these days. When I’m lying in bed at night. Or drifting off to sleep for an afternoon nap. Or lazing in a deck chair. I’ll put my book down, watch a boat go by on the river, and imagine what I’ll wear when I can stand to wear normal clothes again. What I wore on my last day of freedom. All these outfit reveries are by way of staving off cabin fever. I’ve hardly been out of the dooryard (as we say down east) for three weeks, ever since I developed shingles. Okay, there was that one evening when I ventured out for dinner with two friends at a bistro in our little village one evening. Hubby drove me, since driving and shifting (my car is a standard) are painful. But sitting on a patio and eating and chatting I can do. Or thought I could do. I felt good all evening. But I paid for it the next day. 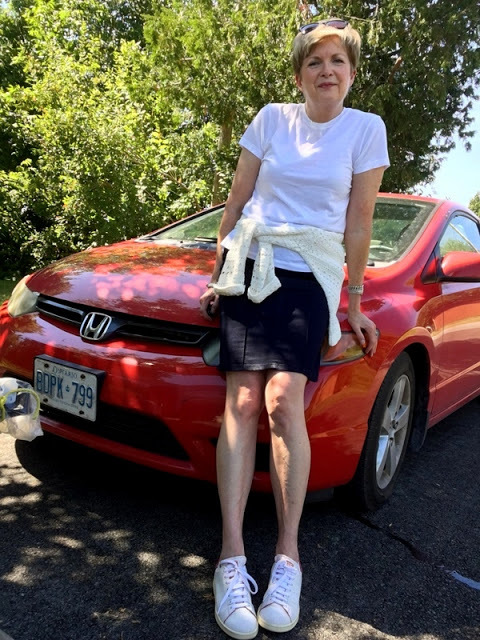 Then there was the morning last week when Hubby drove me to the doctor, and our bumpy road, which hasn’t been paved since the millennium, almost did me in. I’m not joking; jostling is not a trifling thing for serious shingles sufferers. Still, I was able to acquire some serious pain meds that day, which is why I’m doing a lot of drifting and dreaming lately. I should say more drifting and dreaming than usual. As a child, I was frequently accused of walking around in a fog. But fogs can be good. Restful. Good for dreaming about clothes. I’ve always retreated to my closet when I’ve needed solace. Not literally retreated. I don’t mean I’ve spent hours on the floor of my cupboard curled into a foetal position. Just in my mind. Mentally running my hand across the sleeves of jackets, feeling the textures of suede, and tweed, and stiff denim, ruffling through the shirts and blouses, conjuring up combinations. 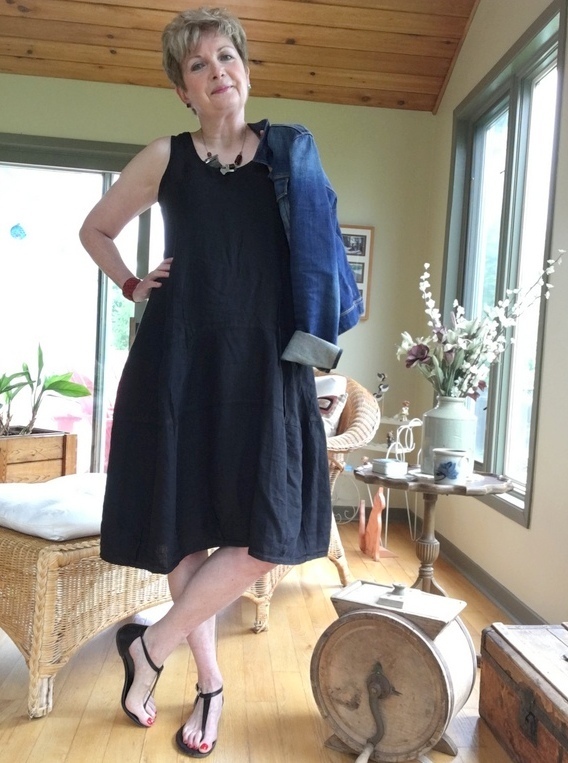 If it’s still hot when I get back on the road, I’ll wear my linen dress. I remember how helpful outfit dreaming was years ago when I ditched my job in pharmaceutical sales and retreated home to the farm for a while, to lick my wounds, and retool, so to speak. My sabbatical year, my friends used to call it. As I worked the final stressful weeks of my sales job, and packed up my apartment, I’d have moments when I feared I was making a huge mistake. So I’d conjure up a picture of myself on a sunny autumn day, in jeans, and a burgundy mohair sweater that I loved, and my step-father’s rubber boots, striding across the pasture, weighed down on one side by a big pail of apples I’d just picked. I’d picture this and my shoulders would drop a little, and I’d smile. And in the first few months back home, in bed at night, I’d sometimes be overwhelmed with fear that I’d miscalculated, made a blundering U-turn, and was going totally the wrong way in life. And I’d lie there and focus on the marvelous suede skirt suit hanging in my closet. Bought with one of my first pay cheques when I worked in sales, it was a gorgeous toffee colour, and soft, like whipped butter, with a long full skirt and a short fitted jacket. It looked wonderful with boots and a cream sweater. I paid way more for it than I could afford. But those nights when I worried that I’d never find a teaching job, that I’d failed at adult life, thinking of it hanging in my closet was comforting. I knew I could put it on, do my hair and make-up, and feel like a million bucks. Even if I was back in my old room at home, at the advanced age of 27, having failed to get the hang of adult life. Ha. And funnily enough, when I finally moved back to Ottawa, that suit became a staple in my teaching wardrobe. I still have it tucked away; I can’t bear to part with it. To me it’s a symbol of that U-turn I took in life, and how well things worked out in the end. So this summer when I’m in need of a little cheering up, I’ve been dreaming of outfits. I’ve been imagining outings and what I’ll wear, when I can get out of baggy tees and pyjama bottoms and back into my real clothes. I’m dying to wear my refurbished Max Mara suit, with my sleeveless linen tank from Vince, and sneakers, and maybe my red cross-body bag. I could wear this to lunch with a friend at one of my favourite restaurants. Or maybe for afternoon tea at the Château Laurier. 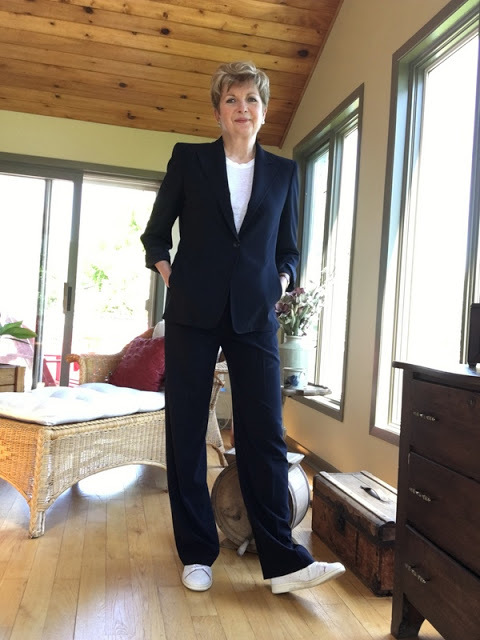 If the suit looks a bit corporate, even with sneakers, I could try to blend in with all the working types, carry my red leather journal and pretend it’s a day-timer, try to look as if I’ve somehow managed to carve out a couple of hours from my very busy day to have lunch with a friend. Maybe even order a pre-lunch martini to look more sophisticated. Ha. Maybe not. I hate martinis. I’ll wear this to lunch or afternoon tea. Or maybe Hubby and I could head away from the city. And spend an afternoon browsing the antique shops in historic Merrickville. We haven’t done that in ages. Maybe on a Friday afternoon, and then we could join a couple of friends for a casual dinner, in nearby Kemptville, at the South Branch Bistro where they have live music in the evenings. I’ll wear my new Moncler baseball jacket and my red loafers. But not with my Zara message tee and white jeans. I’ll swap out the crisp white tee for the Vince sleeveless one, and change the white jeans for my dark denim high-waisted Paige jeans. And do a half-tuck with the tee. All my purses look silly with this jacket, but a knapsack, hmmm, maybe a knapsack would be good. And since I don’t own a knapsack, except for the huge packs we take canoeing, I’ll have to dream up a lovely red or navy one. I might find a suitable knapsack on-line. Not like I don’t have the time to on-line shop. And since I’m only dreaming, I’ll try to magic up some weather more suitable for jeans and loafers and suits. It’s still very hot and humid here. But I’m thinking sunny, and 22° C, with no humidity would be perfect weather for my escape from the dooryard. You know, I read a sweet post on Man Repeller a few weeks ago, on what writer Haley Nahman calls “therapy clothes.” Clothes that she says make her feel happy and like her best self. And all my life, when I’ve felt diminished by events, or afraid, or down in the dumps, just thinking about those outfits makes me smile, and feel a bit better. Clothes as therapy. Or in my case dreaming of clothes as therapy. That’s kind of weird, isn’t it? How we’ve imbued clothes with so much power. Okay… maybe not we… maybe it’s just me. And Haley. I won’t be wearing any of my therapy clothes for a while. Not until this shingles thing dissipates, and I can stand to wear them. Until then, I’ll settle for dreaming, and wearing soft, baggy tees and pyjama bottoms that, while they don’t make me feel confident, sure do feel good. How about you, my friends. Do you imbue clothes with as much power as I do? Any outfit dreams you’d like to share? Hi and so very sorry to hear about this! Shingles is awful so get well quick! In the UK we can get a vaccine after 70 which I accepted with thanks. P.S. Btw, you might be seeing 2 comments from me as I posted a comment using Safari and it disappeared. Trying again with Firefox – all these difficulties commenting are since GDPR! Gosh, I am sorry you are hurting. My husband had shingles a few years ago, and since then we have both received our shingles vaccinations. Three weeks? Such a long time for anyone to suffer with an illness, you poor thing. I'd be dreaming of outfits as well, just to keep this old head thinking about anything other than being in pain. Get well soon!!!! Dreaming of outfits has been a great distraction. Thanks, Pepper. Ah, that's a long time to be dealing with shingles. I hope you're better soon. And I agree there are outfits that are just therapeutic. Hope you can wear them again soon! Nasty business this shingles! On a recent visit to my doctor we discussed the new, improved shingle vaccine. I mention in a past comment I was vaccinated 6 years ago….she has advised me to consider the current (Shingrix) vaccine for protection. After my hubby's past shingles and reading of yours, I will be upgrading!! On the lighter side, my story is….ten years ago… I was a mess when my youngest headed out West for education! For weeks prior I would cry! When the day came to say our goodbyes, my other son turned to me and asked if I was going to be ok. I said I was going to reapply my makeup and head to the mall! Retail therapy! Works for me! Truth be told….if I purchased anything that day I can't remember! Ha! Ha. Retail therapy works too. Too bad I'd have to wear real clothes to go to the mall. Still… there is on-line shopping. I'm so sorry to hear about your shingles. My husband had it a few years ago and he was in and out of bed for a month so hopefully this will end soon for you. My heart goes out to you as you suffer the pain of shingles…it's a nasty, painful condition and I hope that it is fully beaten in the very near future. 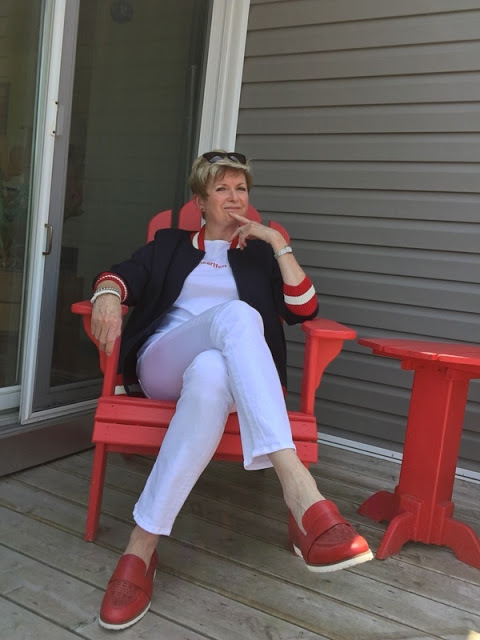 Dreaming of outfits to be worn and ones worn in the past is something that I love to do in quiet moments…clothing can be a powerful motivator and at times a 'soother to the spirit'. The one very special clothing item I remember is from the time I was 5 years old…a hand-me-down dress from a cousin in England. It had a pattern of beautiful butterflies over a pale pink and cream diamond design and the full skirt was perfect for twirling…funny thing when I finally met that cousin many, many years later the first thing she said to me was: "You stole my butterfly dress!" We laugh about the wonderful memories that dress held for each of us…now whenever correspondence or a gift is sent across the ocean butterflies are somehow worked into the gift's embellishment. That dress has long gone but the vivid memories remain strong…clothing is tied to emotions and to my way of thinking is far more important than a means to cover nakedness! Here's hoping that you are soon able to make your clothing dreams a reality…get well soon! I forgot to add "Cheers!…Alayne"
Thanks, Alayne. Oh those favourite things that get given away. I remember when I grew out of two dresses when I was eight or so my mum gave them to the across the road neighbour who had three little girls. I remember seeing the neighbour using one of them as a rag… and I felt crushed. Ha. The drama. Maybe we should wear only therapeutic outfits,no? Now is the time, indeed. Trying to scale back on my meds so at least my head will clear, but the process is slower than I'd like. Shingles is such a nasty thing and I do hope you can soon get back into the swing and wear all your lovely clothes that you are currently dreaming about. I probably spend far too long thinking about clothes. I make a lot of my own clothes and half the fun is doing the research and deciding what to make. Clothes often bring back memories of special times, not just the grand occasions but also the more humble outfits that still bring back lovely memories that linger on long after the clothes have worn out. We usually have pictures of the grand occasion outfits. The humble ones are only in my mind. Oh, I'm so sorry to hear you have shingles! It's such a horrible, painful thing. I hope you're feeling better soon. Here, we're looking at another 3 months or so of warm-to-hot weather, so I'm dreaming of all the sweaters, scarves and boots I'll be wearing once it cools down again. Thanks, Sue. I'm always dreaming of sweaters and boots this time of year, too. I am so sorry to know that the shingles are really interfering with your life. But, as always your writing is a delight and once again, I so agree with you. When I was a teenager and until just recently, browsing through Vogue had the same affect on me. I would always relax, feel better by just looking at the beautiful clothing and adverts. I would then see how I could translate a look into real life. But now – well – I find Vogue not relevant to my age group any more. I hope you feel better soon. Elizabeth C.
Thanks so much, Elizabeth. I used to love looking at Vogue too. Now I've found they've lost much of their allure. That is sad, Brenda. Clothes ultimately are just inanimate pieces of cloth. It's the memories they trigger that are special. Still, sometimes they can be a bot like armour for those who, like me, need a little extra courage now and then. Yes, yes, yes, yes, yes! Me, too! Dreaming up fancy outfits I don't own and probably never will (for events I'll never attend) and rocker outfits I do own (for events I probably should dress more conservatively for) and fresh yoga class outfit combinations (tutus may be involved) and "armor" (for those days when life is bloody hard and protection is necessary) is one of my favorite pastimes. I dream about outfits while driving, while falling asleep, while pretending to listen at boring meetings, while sitting on the deck or the porch drinking a glass of chardonnay. Down here, the dog days of summer are upon us, too, good only for growing weeds. I hope your shingles leave soon. By now you've surely paid all your shingles dues. Armour… yes. When we're shrinking inside sometimes a great outfit can help. Love that "fixing to." I sometimes think it's a shame that we hone all these regionalisms out of our speech. I SO admire your positivity here and your ability to keep posting — you will be back wearing outfits you've dreamed of before too long (well, it's probably already been TOO long for you, but you know what I mean), and meanwhile, what a good reminder to all of us of what we take for granted. Ha. No pj's for me in public. And no "unfettered" look either. Kind of wish it were winter when going without a bra would be unnoticeable under layers of warm clothing. I'm sorry your shingles has been so tough – the "trunk" is a notoriously painful and slow to go away place to have them. I had to think about whether I day dream about outfits and I realized I don't, I day dream about interior design, and what I'd change in our home, or if we moved, what the new place would look like, what I'd get rid of, etc. Sometimes I also think about future paintings and compositions – very very little about clothes. Feel better. Thanks, Kathy. I can well imagine that your soothing dreams are of possible paintings. I enjoyed reading the post on “therapy clothes” at 1010 Park Place and also yours about your Helmet Lang jacket. It really does sound perfect and very versatile! 🙂 The style and fabric of the sleeves … and the fact it will roll up quite small and be relatively crease free in a few hours … definitely a keeper. Well done Liz for recommending it. I’m hopeless when it comes to blazer style jackets. I had a great one that fitted well when my middle son was small and I often wish I’d kept it. I’ve a lovely one now but I don’t really feel as I should in it, so consequently it stays in the wardrobe. I’ve decided I look better in shorter, slightly boxy style ones, no buttons or collar … like the Chanel ones. Thanks, Rosie. Now the pain seems to be abating, although not gone, I can't imagine it was so painful to just sit in the car and be driven. The vaccine is only available free to those over 65 here as well. I think that's why my doctor didn't mention it to me before. But I'll be getting the new one which is 97% effective in a few weeks… although I'll have to pay for it. I can see you in a Chanel jacket. Think the style would be perfect for you. You're right about Italy planning. Now that we've had to cancel our summer trip to the Saguenay (in Quebec) as well as out trip home to NB to see my Mum, I'll have lots of time to plan for Italy. Although I must say, I'm going a bit stir crazy being at home so much. A note to Wendy …. (in York) hope it’s ok Sue, it’s just I’ve noticed she’s not committed for a while, which is so unusual .,. Take care, I’ve been thinking about you. I know…me too! We all miss Wendy. I did get in touch a while ago and she was having internet woes. Thanks Sue, hopefully Wendy’s nternet problems will be sorted soon. Sorry about your health situation. I’ve heard the trunk shingles are the worst – most painful and slowest to heal. I suppose I was lucky to have had shingles on my face – very unsightly, but gone in a week. I hope you recover soon and never get them again. A white wool, spring coat that I wore as a teenager. A tweed pants, wool turtleneck and tasseled loafer fall outfit that I wore for many years. A rose-colored, Italian mohair sweater that my parents gave me for Christmas. Decades later, it’s still in lovely condition, and now passed on to my daughter. A navy wool sheath with little zippers at the wrist. My current go-to item. It fits perfectly and, dressed up or down, I can wear it almost anywhere. Thanks, Jo. I think I'd still be wearing that tweed pants outfit of yours. Wish I could still wear a lovely woolen dress I had years ago, in a green jewel tone with three-quarter sleeves. Sigh. Wool dresses are lovely with boots, or as you say, dressed up with heels etc.